Sometimes the colors of nature are so incredibly vibrant. 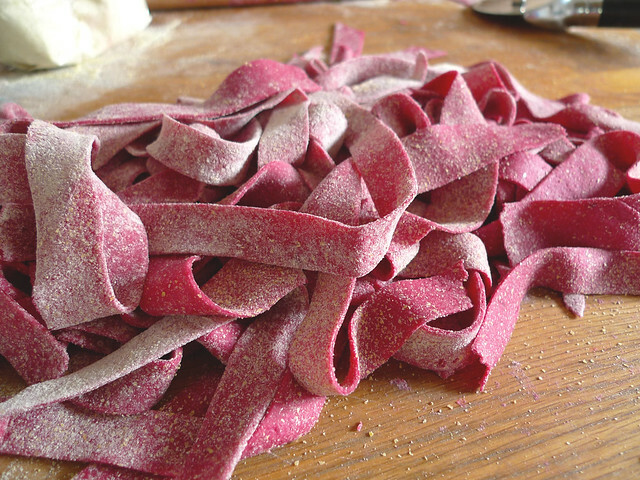 Just look at this beet pasta. It's pink. Really really pink. 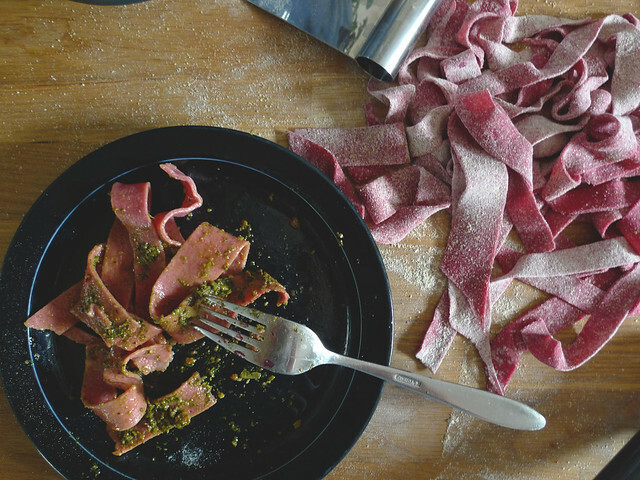 The beet certainly gives this pasta a earthy aroma, but mostly it makes for a very cheerful pasta. Perfect for a special occasion or just the end of a long day. You don't even need one of those fancy pasta machines, you can do it all with a rolling pin and a pizza wheel and three ingredients. Our pasta flour is great for hand rolled pastas, it's the perfect ratio of Golden Durum and White Sonora flour. The durum gives the pasta some bite and the White Sonora gives it a light silkiness. 1. Wash and chop the ends of the beet off. Boil it for 30-40 minutes or until soft (test it with a fork, if the fork pierces the skin easily, the beet is done). After it is cooked, drain and peel away the beet skin and coarsely chop. In a food processor, combine eggs with the chopped beet and pulse until creamy and smooth. 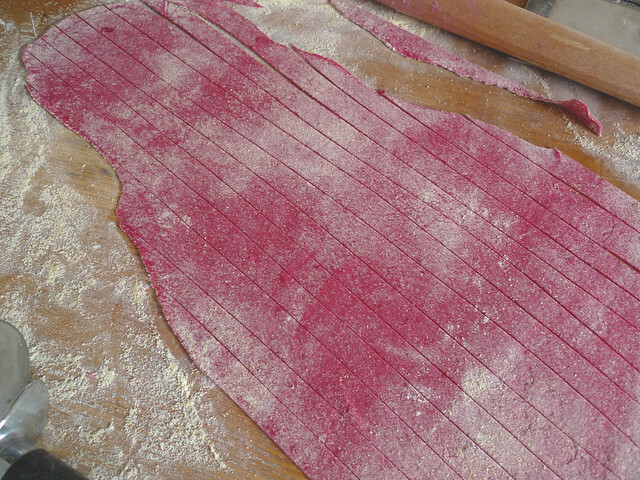 Remove any big chunks of beets, as those will tear the pasta dough. 2. Next, pile the pasta flour on a good work surface and shape it into a volcano. 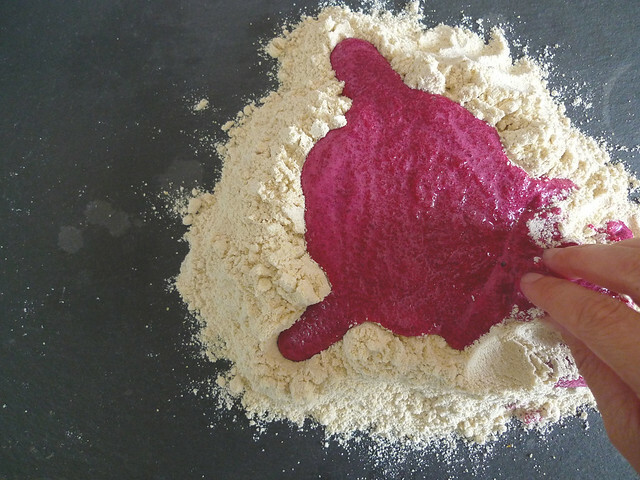 Pour the beet mixture into the crater that you just formed in your flour volcano. 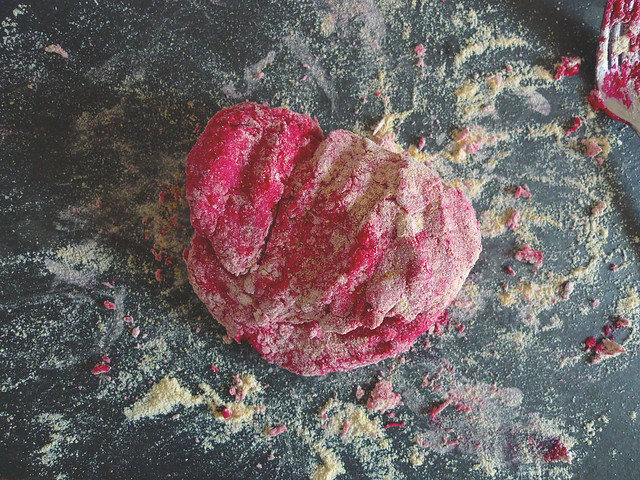 Use a fork or your hands to slowly combine the flour with the beet mixture. 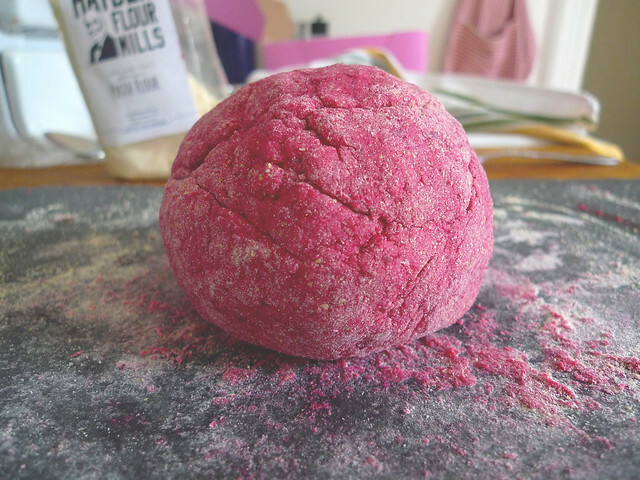 As the dough starts to come together, knead it into a ball, adding more flour if you find that the dough is sticking to your work surface (the beet adds a lot of moisture to this dough, so depending on the size of your particular beet you may find that you have to add in up to 1/4 cup flour to stop the dough from sticking). Cover the dough in plastic wrap and let it rest for 30 minutes. 3. After the dough has rested, cut it into 4 sections. Prepare a large work surface by dusting it with pasta flour. Using a rolling pin, roll one section of the dough out flat. But not too thin. It will take a few repetitions of rolling out, dusting with flour and folding, to get the dough prepped. When the dough feels firm, but not too dry, roll it out to the thinness of a dime. Use a sharp knife of pizza wheel to cut thick noodles (don't worry about getting them all the same size, just eyeball it). Separate the noodles and dust with pasta flour to keep from sticking together. You can stop here and freeze the pasta for cooking later. Otherwise, boil a stockpot of salted water, add the fresh pasta and boil for 4 minutes. Serve with Pistachio Pesto (see recipe below) or any sauce of your choosing. 1. Wash the basil and soak the leaves in cold water for 20 minutes, this removes any bitterness. In a food processor blend the basil while slowly adding in the olive oil. Next add the garlic and pistachios and pulse until smooth but still grainy. Salt and pepper to taste. To store for later, refrigerate with a thin layer of olive oil on top of the pesto. Posted on October 10, 2013 by Emma Zimmerman and filed under Dinner, Recipe and tagged Pasta Flour 2013.